As in 2014, the 2015 outlook for the French ICT industry looks reasonably favourable with sales growth expected to increase by 2 %. According to French research institute Xerfi, sales in the French IT segment increased 5% in 2014, mainly due to French companies boosting their IT expenditures - especially in new servers and analytic equipment for big data. Software, consulting and services activities amounted to EUR 49.5 billion (up 1%). SMACs (Social, Mobile and Analytics in the Cloud) and SaaS (Software as a Service) technologies recorded sales increases of 22% and 30% respectively. The cannibalisation of PC sales by tablets continued in 2014, with the latter being the main growth driver in the hardware sector. However, the sales of tablets also slowed down in Q4 of 2014 (down 16% year-on-year) and sales prices decreased (one third of tablets sold at a price less than 100 euros). Smartphone sales increased 15.2% in volume to 18.2 million units in 2014. As in 2014, the 2015 outlook for the French ICT industry looks reasonably favourable with sales growth expected to increase by 2%. IT expenditures are expected to increase further due to the expansion of cloud computing, big data democratisation, and the need for higher mobility – now a must-have for many French businesses, driving servers and IT consulting demand up. The software segment is expected to grow 3.4%. Computing hardware should grow to support the upgrade of infrastructure linked to the development of SMACs (expected to grow 18%) and SaaS projects (forecast up 25%). That said, it is expected that the sales slowdown in the tablet segment in terms of volume and value will continue (average prices decreased by more than 60% between 2010 and 2014). According to GfK, tablet sales will reach 5.5 million of units in 2015, a year-on-year decrease of 11.3% (after increasing 70% in 2013 and 2% in 2014). 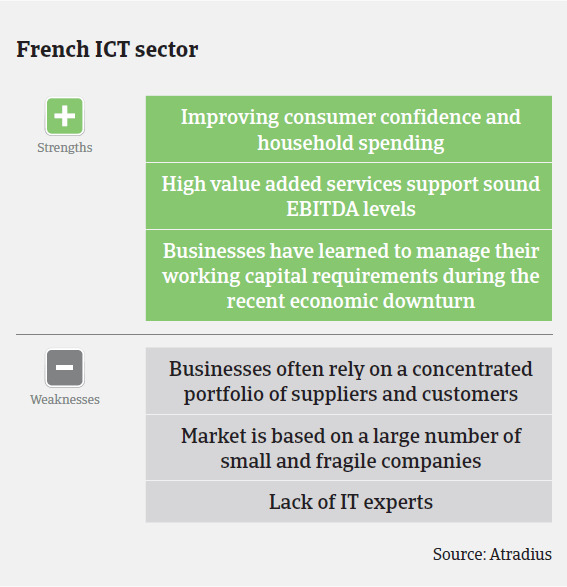 Despite overall growth, many French IT and consumer electronics companies suffer from structurally tiny margins, with equity ratios often not higher than 15%. IT service providers operate with earnings before interest, taxes, depreciation and amortization (EBITDA) margins of only 7%, compared to 14% for software editors. Hardware wholesale margins rarely exceed 10%. IT service providers are competing on low added-value activities, while programmers and software editors have more market power and can generate higher prices. Margins will remain tight and working capital requirements will be a key issue for many ICT businesses again in 2015. Some ICT wholesalers are expected to suffer from the euro devaluation as most purchases are done outside Europe and billed in USD. We expect payment delays to remain generally stable in the coming months, as the cash reserves of many electronics/ICT businesses are satisfactory. 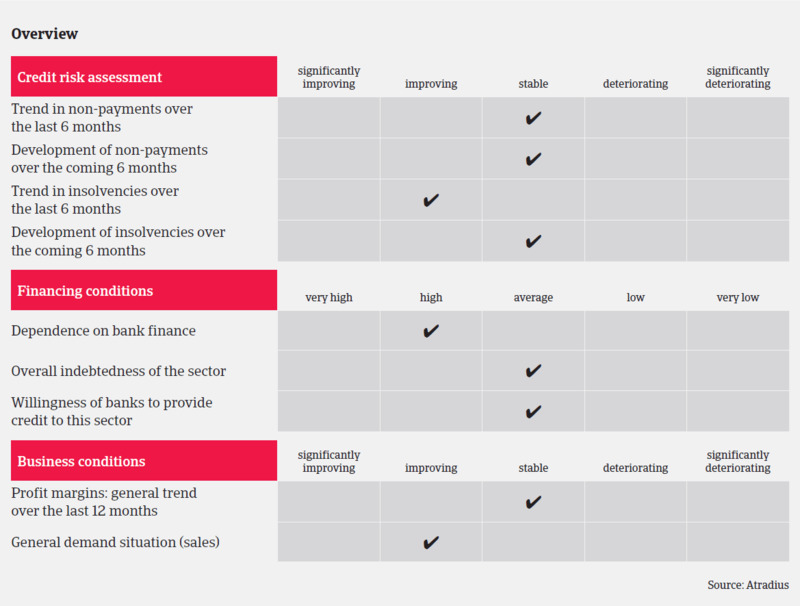 In addition, credit facilities will be reassessed by banks, based on positive 2014 balance sheets. However, there is almost no doubt that banks will continue to be restrictive in granting loans to businesses that are performing rather weakly. The modest decrease in the level of bankruptcies at the end of 2014 should confirm a satisfying credit insurance claims trend in the ICT sector, that is still considered low, stable and acceptable in volume. Our underwriting position on smaller limits has been softened to maximize customer satisfaction, however excluding some wholesaling activities on which we decided at the end of 2014 to maintain a more conservative approach (level of claims frequency higher than total French average). We have to take into account that the risks for many electronics/ICT businesses are still high, especially for very small businesses with limited equity bases, as they will struggle to absorb any further decline in margins. For companies with more than 20 employees, the challenge remains to absorb protracted payments from their key customers. Late payment of domestic and foreign B2B invoices is reflected in the 52 day average DSO figure of French survey respondents (nearly two weeks longer than two years ago). In 2015 the French economy is expected to grow 1.1% as private consumption, manufacturing and exports improve. However, this projected growth rate remains below the forecast eurozone average of 1.4%.